Get beauty, value, and practicality in the flooring you choose for your home remodel. Select luxury vinyl flooring in Jackson, TN. At The Floor Trader of Jackson, we have a warehouse stocked with a multitude of brands, styles, and colors of vinyl. Our two most popular options are vinyl that looks like ceramic, porcelain, or slate tile, as well as vinyl that resembles hardwood plank. Our customers include home and business owners, flooring installers, contractors, and builders. What they have in common is the enjoyment that comes from getting a great deal on floor coverings for their project. We operate as an outlet, which means we offer a huge selection of cash-and-carry flooring. Our business saves you money by buying in bulk. Vinyl is the most versatile of floor coverings. You can find vinyl in our store that mimics high-end types. During the manufacturing process, vinyl is embossed to take on the appearance of tile or hardwood. These advanced manufacturing techniques produce realistic results. 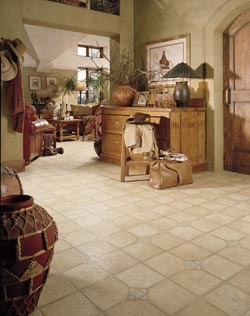 For our customers who love the appearance of ceramic flooring, we offer luxury vinyl tile. The classic appeal of tile is welcome in any room. It has a clean look that can provide an elegant background. Or, you can use differing colors, patterns, shapes, and sizes to create flooring that serves as the focal point of a room. Another perennial favorite is luxury plank flooring. This vinyl has the rich look of wood species with all the details you love about hardwood flooring, such as knots, whorls, and patterns. Our affordably priced LVP provides your remodeling project with the elegant appeal of real wood. COREtec - This is engineered luxury vinyl flooring. Made of four layers, COREtec is rated for commercial foot traffic, is waterproof, and comes with an insulating layer of cork. Shaw - This manufacturer puts its name on beautiful and durable resilient vinyl floors with the look of tile and wood. These floor coverings are made to be easy to clean and maintain. Mohawk - Count on Mohawk for high-performance vinyl with the rich texture of wood or the elegant look of tile. This stable and waterproof flooring resists scratches and stains. Downs - Rely on Downs vinyl to be strong enough to stand up the rigors of daily life - including children and pets - and still look fabulous. This company makes waterproof vinyl flooring. Contact us today for information on our brand-name vinyl flooring. We proudly serve homeowners, builders, contractors, and flooring installers from Jackson, Three Way, Spring Creek, White Fern, and Beech Bluff, Tennessee, and the surrounding areas.